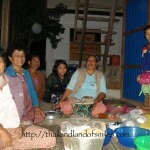 My last trip in January it was decided that I would make the journey to Mukdahan to meet the girlfriends family. I really didn’t know what to expect or how to act other than going with the flow. 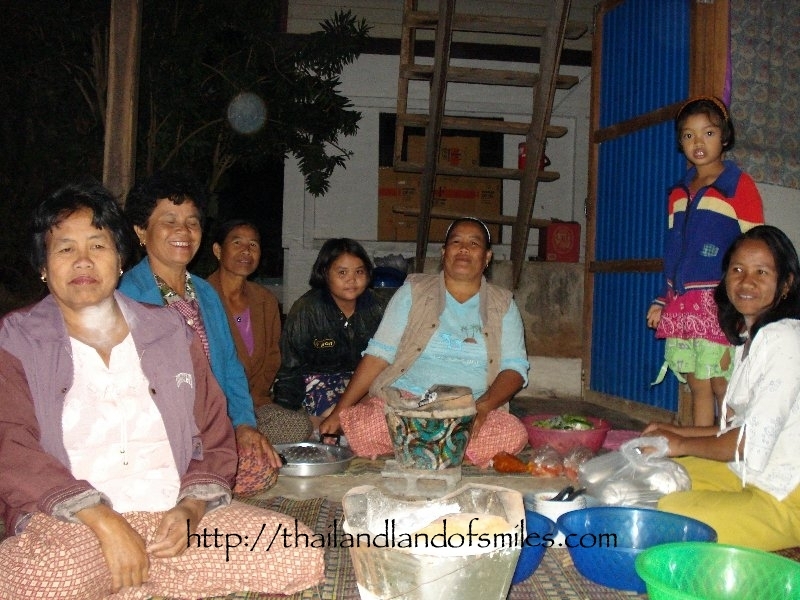 When we arrived at her village Most of the women in the family were waiting for us at the house and a few villagers stopped by to meet the falang as well. They made sure I was comfortable on the front porch and then commenced to cooking food and pouring me a beer as I met everyone. After a little while an ornate silver bowl was brought out and I was asked to stand. Inside the silver bowl was a small banana, sticky rice and an egg. Another family member brought out a small pile of string. The contents of the bowl was placed in my left hand and one by one everyone present tied a string around my wrist while the others touched my elbow. I was wondering if I was getting married and someone forgot to tell me, but as it turns out this is done for good luck. Throughout the day more villagers stopped by to meet the falang and tie a piece of string on my wrist. Eventually day became night and we went to the local Thai BBQ to get food for everyone. Mind you I was buying. Some people will say this is the Thai’s taking advantage of the falang by making him pay but Thai culture says it is for the newcomer to gain face with the family and friends. When you can buy food and beer for twenty people and the total cost is $30.00 U.S. it’s hard to feel taken advantage of…especially when the food and beer last all night. Over the next couple of days I was fed and watered well and driven around town and out of town to see all the sights which seemed to be worth more than the $30.00 I spent for dinner. The rest of the night was spent eating drinking and meeting new people and having many strings tied to my wrist. It was an experience I’ll keep with me for a long time to come.